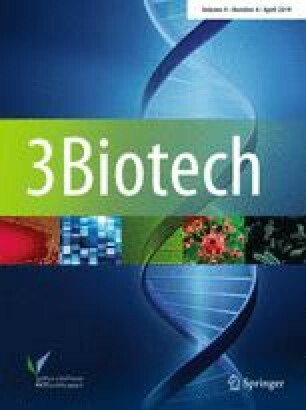 In the present study, we characterized bacteriocin BaCf3, isolated and purified from Bacillus amyloliquefaciens BTSS3, and demonstrated its inhibitory potential on growth and biofilm formation of certain food spoilage bacteria and pathogens. Purification was by gel filtration chromatography and its molecular weight was 3028.422 Da after MALDI-TOF MS. The bacteriocin was highly thermostable withstanding even autoclaving conditions and pH tolerant (2.0–13.0). The bacteriocin was sensitive to oxidizing agent (DMSO) and reducing agent (DTT). The de novo sequence of the bacteriocin BaCf3 was identified and was found to be novel. The sequence analysis shows the presence of a disulphide linkage between C6 and C13. The microtitre plate assay proved that BaCf3 could reduce up to 80% biofilm produced by strong biofilm producers from food samples. In addition, BaCf3 did not show cytotoxicity on 3-TL3 cell line. The online version of this article ( https://doi.org/10.1007/s13205-019-1639-2) contains supplementary material, which is available to authorized users. The authors acknowledge project grants from Centre for Marine Living Resources & Ecology-Ministry of Earth Sciences, Government of India (MOES/10-MLR/2/2007 and MOES/10-MLR-TD/03/2013) given to Dr. Sarita G Bhat, Dept. of Biotechnology, Cochin University of Science and Technology, Kochi, India. The authors also acknowledge Dr. Laxmi. M for providing the biofilm producers.